Join today and save $2 when you use the code SNACKIN at checkout! MunchPak certainly has some competition, with the recent rise of snack subscription boxes. MuchPak, however, offers an international product line that is flat out hard to compete with. There are several other similar international snack box subscription services, such as Japan Crate. Japan Crate will directly ship you chocolates and other Japanese. MunchPak, on the other hand, has access to a wide variety of international treats, not just snacks from one country. MunchPak also sets itself apart in world-wide availability. They will ship to almost anywhere in the world. If you are interested in finding out if MunchPak will ship their products to the country the you live in, check to see if it is listed on the MunchPak website under one of their most frequently asked questions: Where do you currently ship to? MunchPak offers snack bundles for predetermined prices, but you can go on their website and buy individual treats from around the world a-la-carte style. Wide variety of treats from all over the country. You can choose the rate at which you would like to receive snack boxes. Different sizes of snack boxes you can choose. Get the exact size that YOU want! You have the choice to have a tea, coffee, water, juice, energy drink or soda added to your box. Very easy-to-navigate website. Extremely transparent. Some people reported that they did not receive a card within their snack box telling them the origin of the snacks. There is no nutritional information, notes, or ingredient cards within snack boxes. This makes it difficult to properly assess what is in your snack box. If you do not like what you get in your box, you have to pay $0.99 per each item you would like to customize. Getting started with MunchPak is a very simple process. First, you have two different options. You can either choose "give a gift" or "sign up now." We'll use "sign-up now" for now. How often do you want it? Next, you will be asked how often you would like to pay. You can pay for each delivery, or you can commit to a subscription. You have the choice to subscribe for either 1 month, 3 months, or 6 months. For an extra $5, you have the option to add a tea, coffee, water, juice, energy drink or soda added to your box. Once you have finalized your purchase and entered your credit card information, you should be receiving your snack box from MunchPak within 5 to 8 business days. Most people have really enjoyed their MunchPak experience. Their wide variety of exclusive international snacks has attracted the attention of people who enjoy trying new foods and people that love to travel. There are areas within MunchPak, however, where a few people expressed some disappointed. The first was packaging issues. The packaging on the outside looks great and has bright colors, many people were disappointed to find no card that properly explains what each snack is called, as well as where it came from. MunchPak also does not include standardized nutritional information, notes, or ingredient cards. If you have allergies or other health concerns, this may cause some issues. Also, a handful of MunchPak's snack items are not written in English, and if they are, some are written in broken English. If this would bother you, MunchPak might not be the best option. Instead, you might want to try another snack box subscription service such as NatureBox, which clearly labels all snacks with ingredients and other nutritional information. There are other snack box subscription services that offer international snacks, so you are probably wondering how MunchPak is different. Why should you subscribe to MunchPak over its competitors? If you are looking for a wide variety of international snacks from all over the world, MunchPak is exactly what you are looking for. Other snack box subscriptions, such as Japan Crate, offers Japanese chocolates and candies. MunchPak has them beat because every snack that they offer is not from the same country. So if you are looking for variety, MunchPak is your best bet. Considering that both companies offer international snacks, lets take a look at the difference between in price between Japan Crate and MunchPak. Only chocolates and candies from Japan. Wide variety of snacks from all different countries in the World. Which one has the advantage? That's for you to decide. If you are convinced that MunchPak offers a superior service, click here to get started! Australia, Austria, Belgium, Bosnia and Herzegovina, Brazil, Bulgaria, Canada, China, Czech Republic, Denmark, Finland, France, Germany, Greece, Hungary, Iceland, India, Ireland, Israel, Italy, Jamaica, Japan, Jordan, Lebanon, Netherlands, New Zealand, Norway, Philippines, Poland, Portugal, Romania, South Africa, South Korea, Spain, Sweden, Switzerland, Turkey, UK, and the USA. What if I don't like the snacks that I receive? Now that you have read this MunchPak review, you are probably trying to figure out if this is an opportunity that is worth pursuing. MunchPak is best for people who love trying new, cultural foods. MunchPak makes it very easy for you because you simply wait for them to ship your customized snack box directly to you. Unlike other companies, you can choose from a selection of snacks from all over the world. If you are looking for a snack subscription box that clearly labels all ingredients and snack origins, MunchPak might not be what you are looking for. You might prefer NatureBox instead, which is a healthy snack membership company that clearly labels all ingredients to their snacks, as well as where they are from. MunchPak offers a discount to those of you who choose to commit to long-term subscriptions. For example, you could pay for every delivery, every month, or even every 3 months. If you decide to commit for 12 months, however, you will be saving yourself some money. If you pay every delivery, for example, you are paying $3 more than you would if you subscribed for 12 months. This may not seem like a lot, but over the year, you would be saving an extra $36. You can also apply the promo code "SNACKIN" to your first order to save an extra $2. 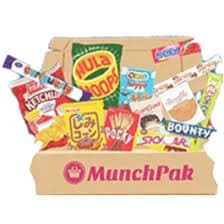 MunchPak is a great opportunity for those of you who are looking for international snack boxes that are delivered right to the doorstep of your home or office. It is fairly priced, customizable, and very functional. It is easy to manage your account and subscription, as well as cancel the account when you are finished with it. There is no funny business, no secrets, and no jokes. Before signing up for MunchPak, take a 6-month or yearly subscription into consideration. This will allow you to save yourself a little chunk of money throughout the year. Interested in giving MunchPak a try? Click here to start your subscription, or to at least check it out! MunchPak is a snack subscription service that provides tasty snacks from all around the World. MunchPak will send snacks from all over the world directly to the door of your home or office. You can also customize your snack box to get what you want, when you want it. To top it off, MunchPak has a readily available customer service team that will help you whenever you have a question. I love the variety that MunchPak offers. I wanted a small box every week, and that’s exactly what I could get from MunchPak. They have the option to get a big box every month or every two weeks, which I think is really convenient. You can get the perfect portion that you need. Their customer service is great and I couldn’t be more ecstatic about MunchPak!! Hey Dealmeisters… I really love the extensive product line that MunchPak is able to offer but they don’t have nutritional information! MunchPak include no nutritional information, notes, or even the ingredients. What about those of us who have gluten allergies?? I can’t even take the chance with this one. Also, I see that the names of the snacks are not even labeled… and if they are, it may be in broke english. I’m not about this. Not sure if I recommend taking the chance on MunchPak. Not for me.. that’s for sure.